Home > Games	> New Apps for the Kindle – More Christmas Holiday Related! New Apps for the Kindle – More Christmas Holiday Related! Here’s more new apps for the Kindle ! ‘Picture Cross Christmas Edition (A Holiday Logic Game for Kindle)‘ by puzzle.tv is available on the Amazon Kindle site for $0.99! Just click here to download! Merry Christmas picture puzzlers ? 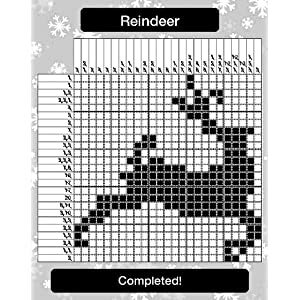 100 all new festive-themed Picture Cross puzzles! Starting with a grid of empty squares, Picture Cross gives you clues in each column and row with which you must work out whether each square in the grid is black or white. Find all of the black squares to reveal a festive picture. Detailed instructions and helpful tutorial are included, and a hint feature is available if you get stuck. Once finished, you can reset each puzzle so you can replay as many times as you like. Picture Cross Christmas Edition includes 100 unique hand-made puzzles, each with a seasonal theme. Puzzles come in grids of various sizes, with 20 each of: 8 by 8, which are nice and easy, 10 by 10, 15 by 15, 20 by 20, and 25 by 25 which are very challenging! The game features fast navigation, check marks and hidden puzzle names. If you love Christmas and love logic puzzles, you’ll love Picture Cross Christmas Edition on Kindle! Check out the other new Kindle apps after the jump! ‘Futoshiki Holiday Edition (A Holiday Logic Puzzle for Kindle)‘ by Braintonik Games is available on the Amazon Kindle site for $0.99! Just click here to download! Futoshiki Holiday Edition takes a cheerful twist as stockings, trees and presents take over the game board. The rules of Futoshiki remain deceptively simple but the game is challenging and addictive. Each row and column must be filled with unique numbers. However, Futoshiki has a twist. It adds greater-than or less-than signs between some cells. You must honor these signs in order to solve and complete the puzzles. This new collection of 120 puzzles is grouped into four different sets ranging from easy to expert. The grids are 5×5 in easy, medium, and hard modes. Expert mode holds thirty 7×7 puzzles. The game features annotations to help you keep track of possible solutions, and a hint function to help you keep playing if you get stuck. Get Futoshiki Holiday Edition and have a delightful time! ‘Mystery Castle: Winter’s Night (A Game for Kindle)‘ by Runestone Games Limited is available on the Amazon Kindle site for $1.99! Just click here to download! Mystery Castle: Winter’s Night is the sequel to the top-rated favorite Mystery Castle: Dawn of Illusion. Monty is back and he’s going to save the Holidays! An ice palace has appeared in the middle of the night and Monty the Wizard returns with 32 stages of puzzles and adventure in this new quest to defeat the nasty demon scaring the people and penguins of a small village. Slide across the ice in this winter wonderland, collecting the evil demon’s magic crystals. Find boxes to build bridges across the dark abyss, and clear the path ahead with giant bombs. Teleport to different areas with the magical staircases and reveal secret areas with the ‘Eye of Truth’. Be careful you don’t fall through the cracked floor! 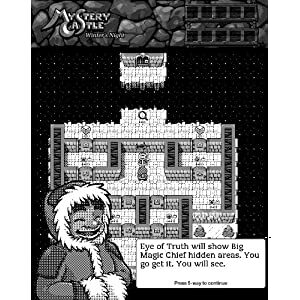 Mystery Castle: Winter’s Night is for people that like brainteasers, puzzles and adventure. Can you solve the mysteries of the castle and save the villagers? Monty is counting on you! 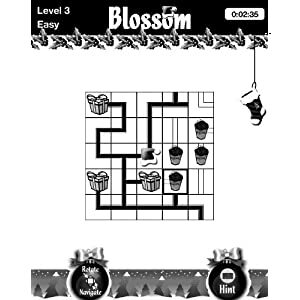 ‘Blossom Holiday Edition (A Cheerful Puzzle Game For Kindle)‘ by Braintonik Games is available on the Amazon Kindle site for $1.99! Just click here to download! Catch the spirit of the holidays with Blossom Holiday Edition! Like an elf, help Santa fix the network of pipes and allow the magical powers of Old St. Nick?s hat to flow through the maze and bring cheer and joy to everyone. As you rearrange the pipes and let the spirit flow, old lumps of coal will change to beautiful gifts for all and save the spirit of the holiday season. This Holiday Edition is packed with a set of 120 new puzzles, which can be enjoyed by all members of the family. This is the lone non-holiday related new app! ‘ Famous Quotes (An Interactive Quote Reference for Kindle)‘ by Fossil Software is available on the Amazon Kindle site for $1.99! Just click here to download! 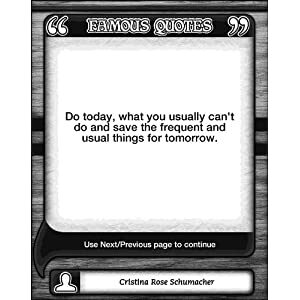 Famous Quotes is a resource designed to connect you with the famous quote you need when you want them. You can search for quotes by author or by keyword – or you can add your own personal quotes and quotes from your favorite author. You can even bookmark your favorite quotes for instant viewing later. Start Famous Quotes and press Next Page/Previous Page to start viewing random quotes. Browse the entire quote collection, or view only your favorites or personal quotes by switching between 1 of 3 viewing modes – All Quotes, Favorite Quotes or My Quotes. Famous Quotes features over 22,000 quotes from over 6,000 famous figures on a variety of topics including Art, Books, Business, Education, Faith, Friendship, Humor, Inspiration, Life, Love, Motivation, Movies, Music, Nature, Poetry, Success, Wisdom and more! Get Famous Quotes, and have an outstanding quotes reference title on Kindle! My Favorite Things Twitter Deal Alert! Kindle Leather Cover, Black (Fits Kindle Keyboard) for $21.99 (37% OFF)!